Parallax effect makes a picture scroll vertically and asymmetrically to the rest of a website, creating an effect of 3D. In WebWave - web design software with no coding- parallax effect can be enabled for any image and element. In this article, you will learn how to build a website with parallax effect. Different scrolling speeds give different effects. Try them all and select the one that suits your website best. Add an image to your website. 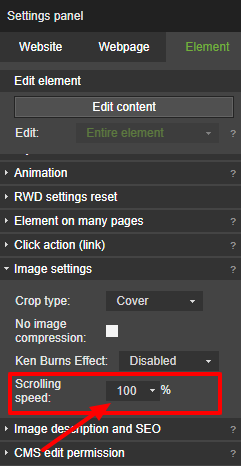 Select an image, go to Settings panel and in "Image settings" set scrolling speed. Add to your website an element of your choice. 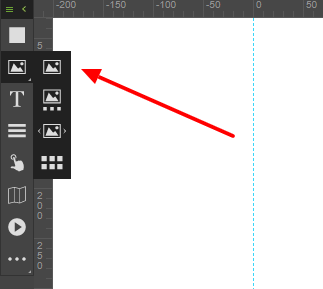 It can be for example a text, button, rectangle etc. Select the element. 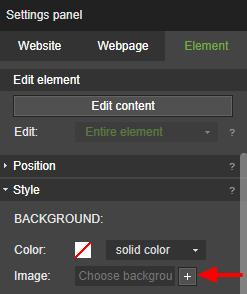 In Settings panel enter "Style", go to "Background" and next to "Image" click on the "+". 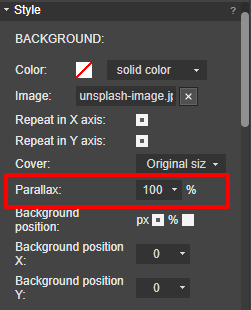 Add an image and set Parallax in the Settings panel.